From the gamer's standpoint, we are in a Golden Age. The combination of crowdfunding and low minimum order requirements at factories means that more and more new creators are releasing their own games. And some are very good, no mistake about it! Others, not so much. Some Kickstarter projects vanish after funding, and some produce a pretty product with no play value. But customers and retailers can't tell which is which until it's too late. This has led to a situation over the last year or so in which the "New Releases" shelf is swept clean every week or two to make way for yet newer material. Unsold inventory increases at the retail and distribution level, and that expense inevitably rolls back on the publisher. This has affected the market in two noticeable ways: many older games are selling fewer copies, and publishers have to print smaller numbers of new games because of how quickly they become "old." This leads to a treadmill effect in which a publisher tries to release more and more games while spending less and less on each one. That's bad for both the publisher and the gamers. Rather than join this treadmill publishing model, we are choosing to strategically adapt by putting more focus and support on our core franchises/titles while limiting new title releases until the correct market environment presents itself. Unfortunately, this also means reducing staff, cutting down overhead expenses, and limiting our presence at conventions, so we can focus on what we do best – create the games our fans have enjoyed for decades. We will continue to grow, expand, and support Munchkin, GURPS, and Ogre franchises, of course. Fantasy Trip and Car Wars will continue to move forward, as well. Thanks for your support as we continue through trying times. Fast forward a couple of months. I asked Andrew whether he'd been able to do anything with the cows. He said "We're putting them in with the unicorns." If you unpack his statement, it would go something like "We figured out that we can do less work AND bring the gamer's per-card price down if we combine two or three mini-packs into one set, so the Cows are going in with the Unicorns and a bunch of undead." In any case, that was how I found out about this set – I checked on my cows and that's where they had gone. 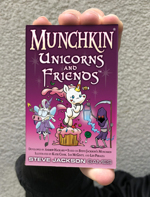 Now it's the Munchkin Unicorns and Friends Kickstarter, which is already going great guns. If you want a big batch of silly new Munchkin cards, please, go support. If you do NOT want more silly new Munchkin cards . . . I don't know what to say. I fear you are lost to me! * Okay, it could be argued that cow jokes ARE business. ** Not that he had asked for them or anything. I just sent them. ***** Now we're into the sheep jokes.